Study Options is the official Application Support Service for students wanting to apply to Australian and New Zealand tertiary vocational education providers; including TAFE (Technical and Further Education) Institutes, Polytechnics and Institutes of Technology. We are a free, independent, expert service for students. We offer advice and counselling to help you choose the right course, at the right college, and are then responsible for guiding you through the entire application process, from making an application to accepting an offer of place. We also provide free assistance with practicalities including student accommodation and student visas. Study Options is the official representative of many Australian and New Zealand colleges, and aims to ensure that the application process is as straightforward and stress-free as possible for you. Study Options is the only organisation in the UK that focuses exclusively on Australian and New Zealand education. Hundreds of students apply to Australian and New Zealand vocational courses through Study Options every year. Click the cover below to open and download the Guide (PDF format). What do you need to think about? This section gives you the lowdown on how to make this dream become real. What are the differences and similarities between an Australian or New Zealand college and those in the UK? 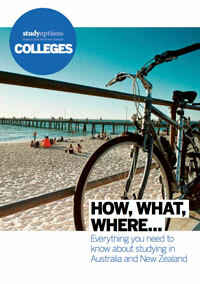 Explore this section to find out more about the courses on offer in Australia and New Zealand. Whether you're looking for a change in career, lifestyle or simply want to see a bit more of the world, there are many reasons for choosing to study Down Under.